Help us keep live music alive—meet us in the park. 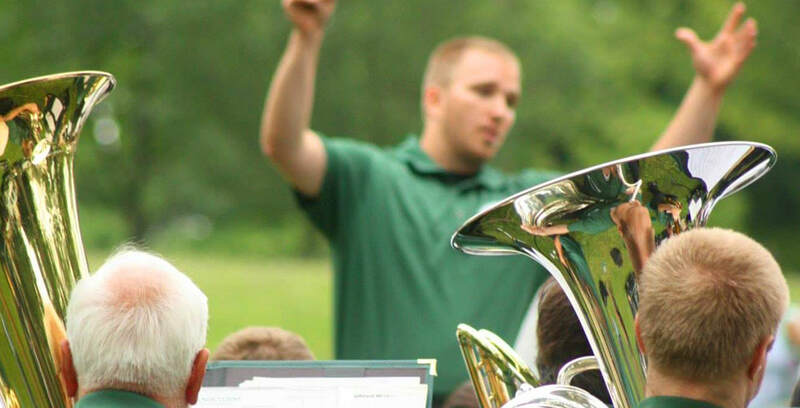 The Batavia Concert Band is a semi-professional, non-profit, wind-band organization that plays every Wednesday night throughout the summer in Centennial Park—where they call home. Though the group of players is extremely diverse, the audience is even more so. The repertoire has something for everyone; marches, big-band and swing numbers, popular songs from musicals and movies, rock favorites, classical adaptations, and everything in-between. The band consists of 45-55 brass, woodwind and percussion players ranging from talented high school students to 60-year veterans. Many have professional experience, others are advanced amateur musicians, but one thing is for sure – all love to play. ​In the age of Apple Music and Spotify, you're invited to join these fully-sponsored events on the south-side lawn of Centennial Park. Wednesday evenings at 7pm. Bring your family and friends, get outside and enjoy both live and entertaining performances. ​Returning for his 7th season as conductor is Mr. John Bailey, Instrumental Music teacher at Lyndonville Central School; who was named Lyndonville's first Teacher of the Year in 2017 while also conducting the Pembroke-Corfu Community Band between 2013 and 2018, has had the honor to conduct two local All-County Concerts and humble recipient of the Helen Bach Moss Memorial Better Beginnings Award presented by the New York State Education Department. In 1924, when Angelo Colarusso arrived to form the Batavia Boys' Concert Band. Colarusso had earned medals and wide recognition in Europe and America as a conductor and baritone horn player. In those first Batavia boys-only bands, Colarusso was both conductor and instrumental instructor, for which he charged the proud boys’ families the princely sum of $3 per month. As the boys matured the band reorganized as the American Legion Band. Edward Sullivan conducted until about 1933, followed by Angelo Zimmarino. The group "disbanded" during WWII and restarted in the late ‘40’s under the direction of Gordon Cox. Two members of the original boys' band, Daniel Martino and Joseph Puccio, continued to play with the band through the early 1980s. To this day one of the Batavia Concert Band’s hallmarks – besides the fact that we have an equal number of men and women – is the wide span of players’ ages, which range from advanced high school players in their teens, to octogenarians who have enjoyed playing for 50, 60 or more years. We learn from each other, we all love to play, and we enjoy bringing quality live band music to the community. In 2015, upon our 90th anniversary we re-designed our brand. Having been in use for over 20 years, our previously admired logo has evolved into something that is reflective of the old but one that fully embraces the new; something that re-establishes the group's longevity and importance in the community. The semi-circle/rainbow shape that we've come to know has been recycled and simplified. It's beauty lies in the subtle contrast of large and small, dark and light – in reference to the groups wide diversity. It may also represent the setting sun on those warm summer nights enjoyed by all those who gather to listen. Or maybe to others it's a theatrical half-note, sticking proudly into the soft lawn of Centennial Park, blasting an unforgettable jazz solo from it's bell. But to others it may be a horizon, foreshadowing the opportunities that lie ahead.